You will be transferred from Dubrovnik’s airport or your Dubrovnik hotel to Gruz Harbor, where embarkation begins at 1.00 pm. Meet your fellow travelers and your Cruise Manager later at an on-board Welcome Reception. This evening, you can relax or take a walk through Dubrovnik’s vibrant streets. 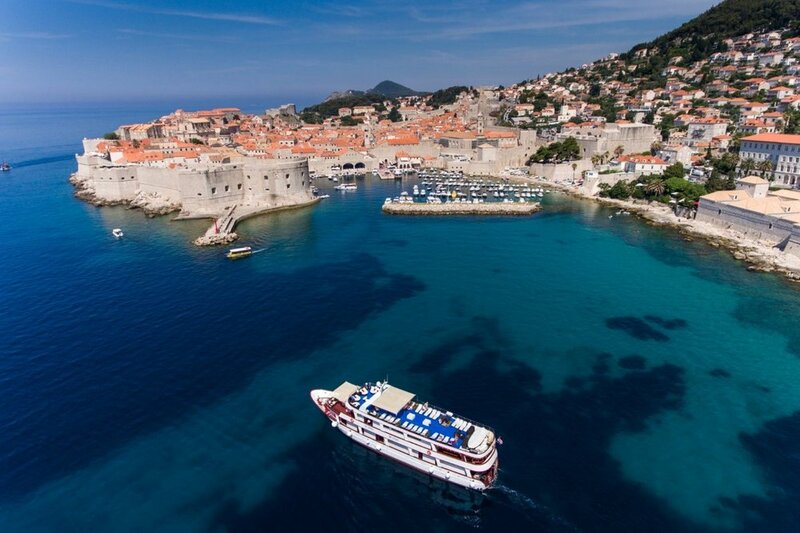 Start the day with a walking tour of Dubrovnik, the “Pearl of Adriatic” and a UNESCO World Heritage site. 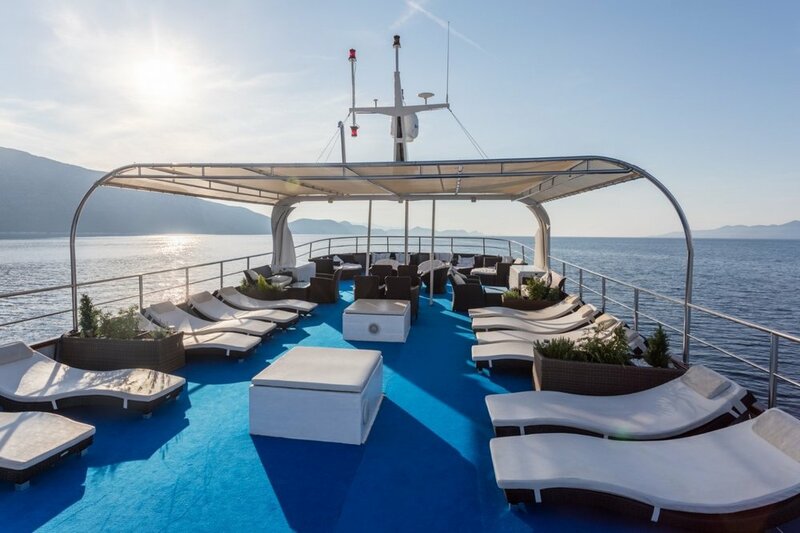 Set sail for the island of Korčula around two o’clock, with swimming stop, if weather permits, in one of pristine bays, time to cool off, relax and lunch on board. Continue towards Korčula, the most preserved medieval town whose street design is based on a fish bone pattern, to spend the night there. This morning, a walking tour of Korcula takes you through its narrow, cobbled streets full of history. Later in the morning set sails towards the island of Brač, village of the stone sculpture and music culture Pučišća, where you can visit amazing stonemason school (optional). Lunch on board. Enjoy a swim in one of Brač’s many lovely coves and bays, if weather permits. Depart for Omiš before breakfast, it’s fortresses are silent stone reminders of the power and might of the infamous pirates who once made their homes and fortunes here. You will have a possibility to book a short walking tour, followed by boarding a small boat and sail into Cetina River Canyon, a protected nature area, continuing to Radman Mills for a local specialty snack. 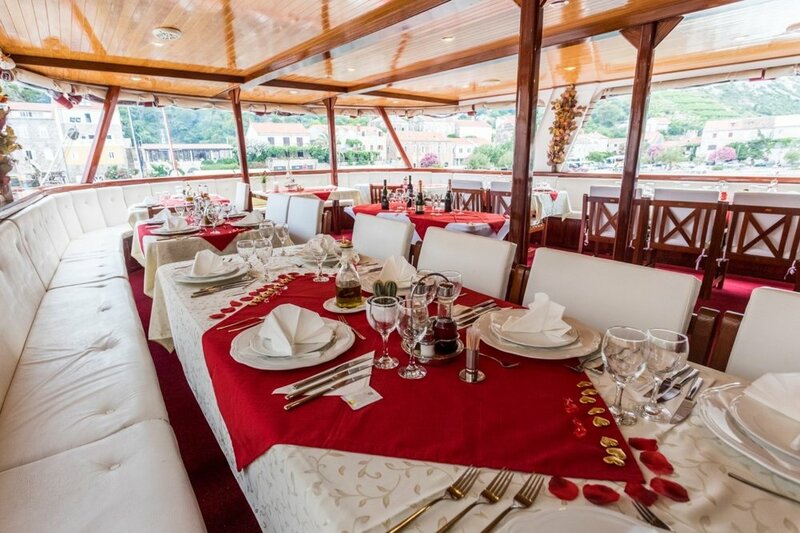 After visiting Omiš set sail to Split with a stop along the way to swim, cool off and relax, if weather permits, with lunch on board. In the late afternoon arrive Split. Take a guided tour of the city, the seafront promenade, and Roman Emperor Diocletian’s Palace. The historical center of the city is listed as a UNESCO World Heritage site. Your evening is free in Split. Stop in Bol, a small town on Island Brac, for a swim at the Golden Horn. Enjoy the 530 m long golden pebble beach said to be the best in Croatia. It is unique in that it changes shape and position depending on the winds. Return to your boat for lunch. After lunch head to Hvar. It is one of the most popular islands in the Adriatic and a meeting point for the international jet set. The “Croatian Madeira” is also one of the longest islands stretching along the shores of Croati. Sightseeing tour of Hvar town shows you the first public theatre in Europe (older than Shakespeare’s theatre in the UK) and many more historical sites. Your evening is free to explore Hvar on your own. Note: Due to the limited capacity of the Hvar harbor (during peak season in July and August) port of call can be substituted for Stari Grad/Jelsa. In that case transfer by bus will be organized to and from Hvar. Departing from Hvar in the morning, sail to Mljet Island includes a stop for swimming, if weather permits, and lunch on board. Mljet, Croatian “Greenest Island” will hypnotize you with its beautiful, untouched nature and its cultural heritage. Arrive in the heart of Mljet National Park which encompasses five types of forests, many species of birds and two deep lakes. If you want to visit Mljet National Park, walk to the entrance where you can purchase the ticket to walk around the Great Lake and the Small Lake and join the boat ride to St. Mary Island. Have a Captain’s Dinner on board. Spend the night in Mljet. In the morning continue our adventure by sailing back to Dubrovnik. Lunch on board with stop for swimming. Early in the afternoon we arrive in Dubrovnik. After breakfast it’s time to disembark at 9.00 am. You will be transferred to Dubrovnik airport or your Dubrovnik hotel. • Professional English-speaking guide for city tours of Split, Hvar, Korčula, Dubrovnik with transfers and panoramic photo stop. Luxury vessel was built in 2013. Maximum capacity is 36 passengers in 16 twin or double beds cabins and 2 triple cabins. 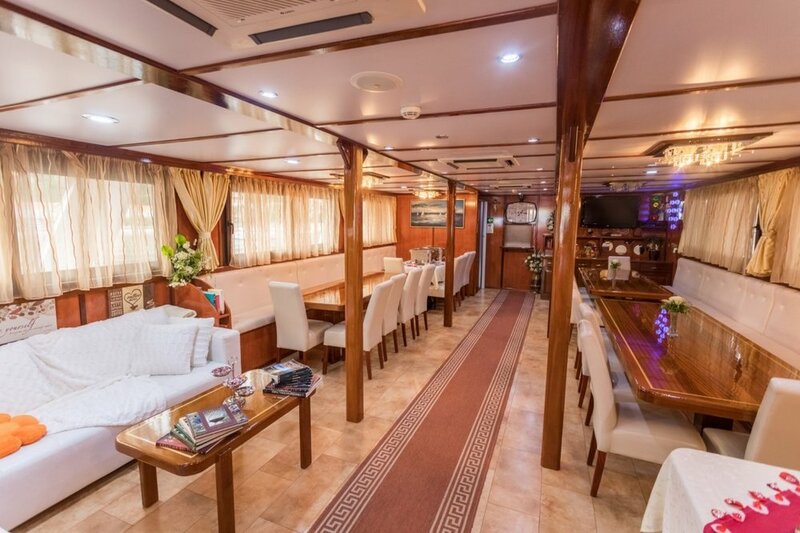 All cabins have been built by up-to-date standards, each, fully equipped with A/C, LCD TV, safe deposit box, fire alarm, internal communication system between rooms. 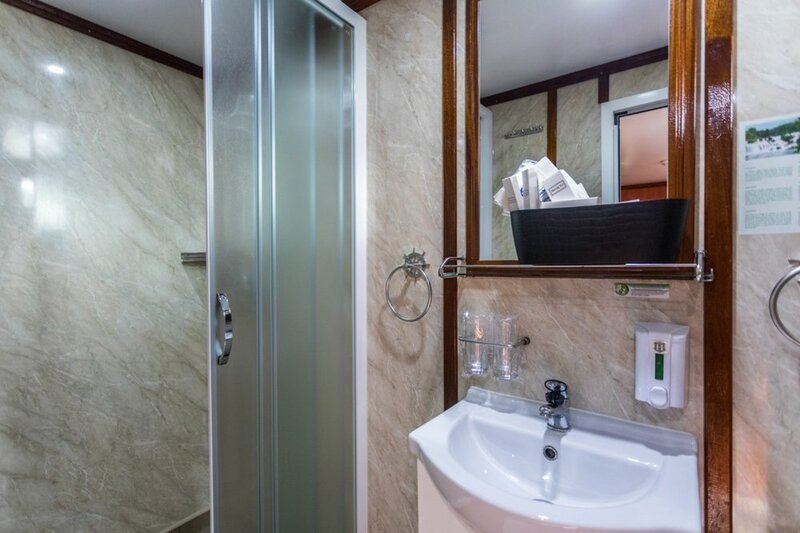 Bathrooms are equipped with toilet, shower, wash basin, also included is hair dryer, slippers, bathrobe and for added convenience cosmetic package. All cabins are sound-proof and each cabin comes with the fire-proof doors, guaranteeing privacy for all guests. The restaurant area is fully air-conditioned for passengers comfort. A portion of the dining area extends outdoors, offering sweeping panoramic views of the surroundings area and it can accommodate all passengers at once. The restaurant includes bar area with LCD TV, there is also a corner table for buffet breakfast. There is also free wireless internet access (Wi-Fi).The lounging sundeck has a total surface of 2,368 square feet, partially offering sun-shade cover and providing deck-beds for all passengers. The ship has a rear access platform to the sea as well as ladders for easy access to the water. In addition, the vessel offers two outdoor showers and four deck lavatories.